Semi-annually I cycle through the stocks in my investing universe and update my intrinsic valuation each company. It is now time for the Boeing Company (BA) to be updated. I have been a Boeing shareholder since July 2013. Needless to say the investment has been fantastic with the only regret being that I didn't buy more at the time. The Boeing Company (NYSE: BA) is an American company that designs, manufactures, and sells airplanes, rotorcraft, rockets, satellites and missiles worldwide. The company also sells support services to the operators of the equipment. Boeing is the largest global aircraft manufacturer by market capitalization. Based on revenues it is also in the top five largest defense suppliers in the world. Boeing is the largest export earning company in the US. Boeing was founded in 1916 by William Boeing. During the 1990's the company undertook a series of transformational transactions with the acquisition in 1996 of Rockwell’s aerospace and defense divisions and then in 1997 Boeing merged with McDonnell Douglas. Boeing kick-started its satellite business in 2000 by acquiring Hughes Electronics (the Hughes Space and Communications Company was a pioneer of the satellite communications sector). In 2006 Boeing formed a joint venture with Lockheed Martin called the United Launch Alliance. This company is the largest provider of rocket launch services to the US government. Just recently Boeing announced the formation of a joint venture with Embraer (ERJ). Boeing will own 80% of the venture which will house Embraer’s commercial aviation division. Embraer has been one of the largest global providers of regional commercial aircraft (capacity of around 100 seats). Defense, Space & Security (23%). Boeing is a major component of the Aerospace & Defense sector. This sector is relatively mature and has historically been very cyclical. The sector’s commercial revenues are heavily influenced by the state of the global economy and its military revenues by the health of global government budgets. Boeing has grown through a combination of natural sector growth, product innovation and through strategic acquisitions and mergers. This has led to Boeing being the biggest global player in the Sector by market capitalization. The commercial jet market is essentially a duopoly between Boeing and Airbus SE (EADSF). There is some minor competition at the bottom end of the narrow-bodied segment but no competition in the wide-bodied market. The commercial jet market is segmented by seating capacity and flight range. At a crude level the market can be broken into narrow-bodied planes and wide-bodied planes. Market observers such as Flight Global and CAPA – Centre for Aviation are forecasting that Airbus and Boeing will have a combined market share of approximately 86% in the narrow-bodied market (with Airbus just shading Boeing) whilst Boeing will have a market share of 59% of the wide-bodied market with Airbus having the remainder. relatively low cost production due in a large part due to scale. 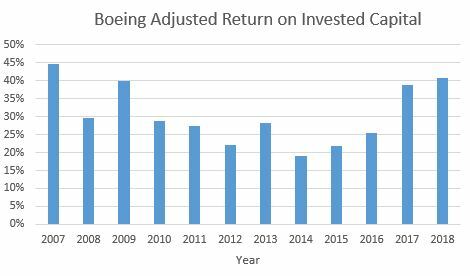 I think that it is unlikely that Boeing’s moat will be breached for many years to come which should ensure superior future returns on invested capital. disciplined production rates (ensuring that demand is firm before adding capacity). phasing its R & D investments. growing the services segment (which is claimed to not be cyclical). strategic relationships with its joint venture partners (Embraer, Safran, Adient and KLX). The company recently announced that its proposed joint venture with Embraer had received the necessary approvals from the Brazilian government. This transaction will move towards closure over the coming months. The chart indicates that over the last year the Boeing share price has increased by almost 9% and has exceeded the S&P500 index by over 13%. A large part of the divergence has recently taken place following the announcement of Boeing’s 2018 full year financial result. 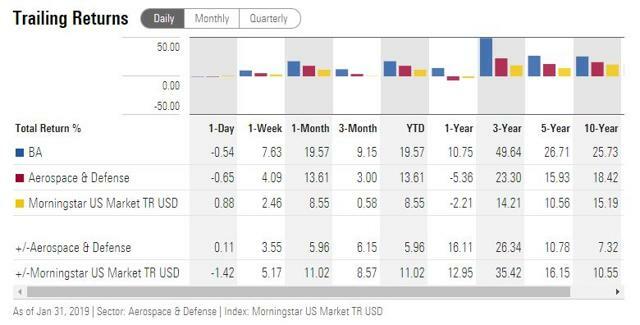 The data from Morningstar shows that Boeing and the Aerospace & Defense sector has consistently outperformed the S&P500 index for over 10 years. The data also shows that Boeing has consistently outperformed its sector over the last 10 years. It’s fair to say that Boeing’s shareholder returns have been spectacular. The global commercial jet aircraft market is relatively easy to analyse given the small number of companies who participate in the market. The market is segmented by seating capacity and flight range. 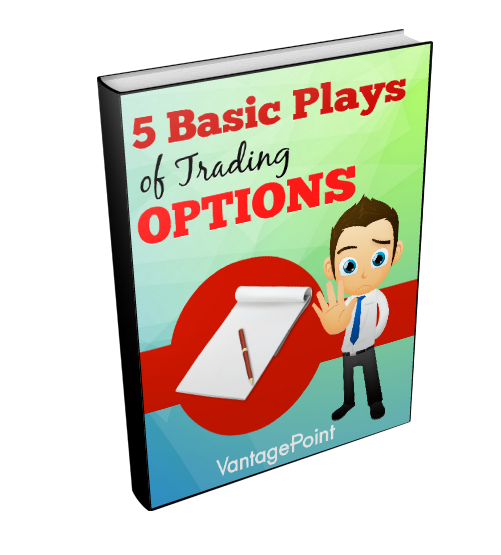 At a crude level the market can be broken into narrow-bodied planes and wide-bodied planes. Market observers such as Flight Global and CAPA – Centre for Aviation are forecasting that Airbus and Boeing will have a combined market share of approximately 86% in the narrow-bodied market (with Airbus just shading Boeing) whilst Boeing will have a market share of 59% of the wide-bodied market with Airbus having the remainder. The following chart showing the historical numbers of delivered commercial jet aircraft was prepared using publicly supplied information from Boeing and Airbus. 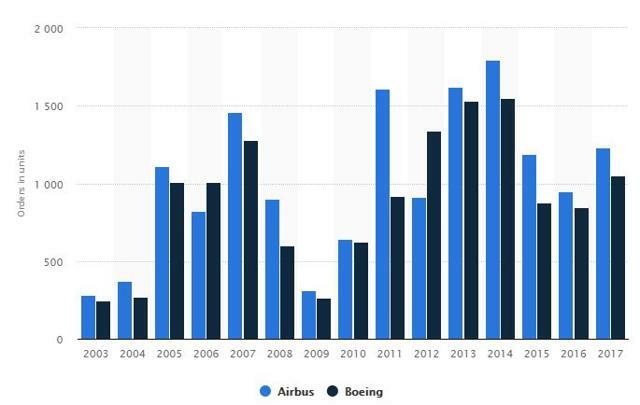 The key take away from this chart - there is very little difference between Boeing and Airbus in terms of the aggregate numbers of aircraft delivered most years. The chart also shows the cyclical nature of the sector. The data is clearly showing a rising trend in revenues but it also shows that since 1988 the maximum number of consecutive years of positive sales growth experienced by Boeing has been 5 years. A down year typically happens every 4 years and sales often continue to fall for 2 years before rising again. The demand for commercial jet aircraft is, unsurprisingly, driven by the demand for passenger travel. This market is mature. Consensus estimates are that demand is growing at a little over 4% per year. To some degree both Boeing and Airbus can be reasonably confident about their near term sales projections. Customers are required to make a financial commitment in order to gain a guaranteed slot in the production schedule. Both companies are currently reporting a sales backlog of around 5 years. Although there is reasonable confidence about the long term revenue projections for the Commercial Aircraft division it is very difficult to forecast the demand for the Defense sector. Many of the purchases for the military are “one-off” projects linked to specific systems. Boeing believes that the global market size for this sector over the next 10 years is about $8.1 trillion. Boeing has more competitors (often working as consortiums) in the Defense segment which increases forecasting complexity. The chart demonstrates that there has been no growth in this segment for many years and until recently, revenues have been flat to declining. There is little doubt that governments will be forced to re-equip their military systems at some point in the future but counter-vailing budget pressures will keep a lid on any significant growth in spending (unless a war breaks out). 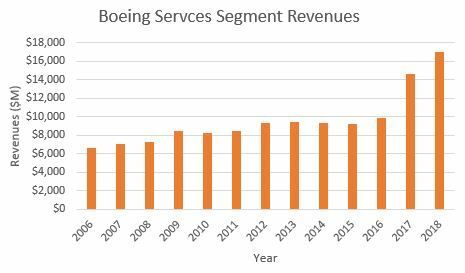 Boeing now reports its Services segment separately (previously it was grouped within Defense). 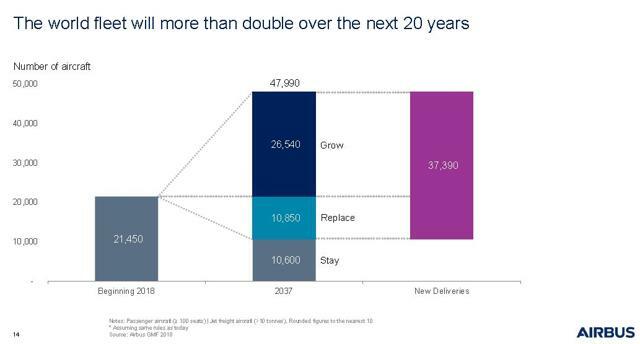 Boeing’s management believes that the market for Services will grow at around 3.5% compounding and the available market is expected to grow to $2.8 trillion in size within 10 years. Clearly there has been a stepped increase in Service revenues over the last 2 years. Boeing’s management is confident that the demand for Services can be less cyclical than the rest of its business. This segment’s recent increase in trend growth, given its higher margins, has made a significant contribution to the financial performance of the company. When I value companies I always like to compare the key valuation metrics of the company with typical values for the Sector in which it competes. In the case of Boeing, there is really only one company to compare it with – and that is Airbus. The data shows that over the last 5 years both companies have experienced similar revenue growth rates. 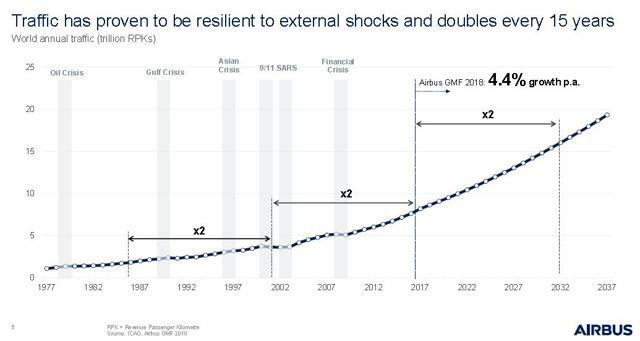 Arguably, Airbus may have grown slightly faster but it is probably fair to say that the market-shares of the 2 companies are reasonably stable. The data indicates that Boeing’s reported Operating margins are consistently significantly higher than those reported by Airbus. It is worth exploring whether we can identify any obvious reasons for the differences in operating margins. Why are Boeing’s operating margins consistently higher than Airbus? It is able to sell aircraft at higher prices. It manufactures aircraft at a lower cost. It is capitalizing less expenses than its competitor (hence reporting lower total expenses which will then lead to a higher margin). Both Boeing and Airbus regularly publish price lists for their aircraft. Of course the prices actually paid by customers are undoubtedly quite different to the list prices (it is rumored that the discounts may be up to 50% off list price). Industry commentators such as Airways Magazine have concluded that there is no clear winner. There are differences in specifications between the 2 companies which could account for the differences in price. Similarly, I don’t think that there is sufficient public information to be able to make a judgement about the operating cost structure of the rival manufacturing facilities. It is rumored that Boeing has a lower cost structure but I have no way to confirm that position. We do however have sufficient information to form a view on the relative capital efficiency of both companies. We need to determine how much both companies are investing to generate their sales revenues and from this we can estimate their relative efficiency. This ratio is important because Research & Development expenses should form part of the company’s reinvestment to grow future sales. It is understood that both Boeing and Airbus gain significant longer term benefits from their Research & Development expenditures (potentially benefits over more than a 10 year period). For this reason, later on I will adjust the reported Operating profits to account for the immediate expensing of their Research & Development investments. The R & D Expense / Revenues ratio is indicating that Airbus is spending more on R & D per unit of revenue than Boeing. Therefore some of the difference in operating margin is explained by this ratio. The data indicates that Airbus spends significantly more net annual capex as a proportion of revenues each year compared to Boeing. The data indicates that in recent years both companies have spent relatively small amounts on acquisitions and Airbus, in particular, has been a net seller of businesses. I don’t think that acquisitions have made a significant contribution to the financial performance of either company. 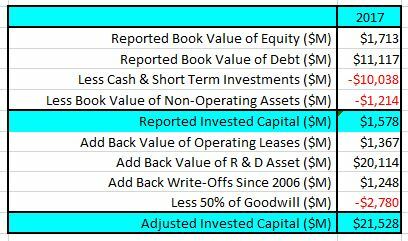 A quick way to look at a company’s capital efficiency is by calculating the ratio of Sales Revenues to Net Capital (where net capital is book equity plus book debt plus operating leases plus the R & D Asset less cash, marketable securities and equity investments). The R & D Asset was created by aggregating the company’s R & D spend for the last 10 years. I have assumed that the asset has a 10 year life and I have depreciated the asset using a straight-line method over its 10 year life. This process then lends itself to a restatement of the Income Statement – more of that later. The data demonstrates that Boeing has a significantly higher capital efficiency compared to Airbus. This is an important aspect of Boeing’s competitive “moat” relative to Airbus. It suggests that Boeing generates more revenues per unit dollar of investment relative to Airbus and that these revenues come with higher operating margins. As mentioned previously, Boeing’s Operating Income needs to be cleaned up in order to eliminate the impact of expensing Research & Development but we also need to back out the impact of operating leases. Operating leases are a disguised form of off-Balance Sheet financing. This Discounted Cash Flow valuation is based on the Free Cash Flow to the Firm – because we do not include Interest Income received in our cash flows we must be consistent and eliminate any Interest Expense as well. Boeing’s reported Income Statement contains an interest expense component in the operating rents paid by Boeing. For this reason, we need to re-state the Operating Income in order to ensure that we are being consistent. For the same reason, we need to add back the interest expense attributable to Boeing Capital which is included in the reported gross margins. At the same time, we need to add back any one-off expenses which have been included in the reported Operating Income. Boeing has yet to publish its full 2018 accounts so I have not been able to identify any one-off expenses that need to be added back to the interim results. Similarly, the interim financial results do not disclose sufficient information about the current levels of operating leases. Historically Boeing’s operating leases have been relatively small and stable therefore I am going to assume that the operating lease expense was the same in 2017 and 2018. This adjustment requires the creation of an Operating Lease Asset which is equivalent to the present value of the Operating Lease Debt. The value of the asset is then amortized over the life of the operating lease. This adjustment requires the creation of an R & D Asset using the method described earlier in this article. The asset is expected to have a 10 year life and it is depreciated using a straight-line method. Unusually this means that the adjusted 2018 Pre-tax Operating Income is $611 M lower than the reported number and the adjusted pre-tax Operating Margin decreases from 11.85% to 11.25%. I noted that it was unusual that the adjusted pre-tax Operating Margin declined. Normally when this exercise is conducted, the operating margin increases due to the lower level of expenses. In Boeing’s case the margin declines because Boeing is starting to spend less on R & D relative to its historical rate of spending. The ROIC is trying to estimate the return on the company’s operating assets which can then be used to determine whether the company is allocating capital efficiently. We have already adjusted the Operating Income. The Operating Income now needs to be taxed. For the 2018 year, Boeing’s reported effective tax rate was historically low at 9.9%. Boeing has indicated in its forward guidance that its effective tax rate in 2019 is expected to be 16%. For this calculation, I have used a notional effective tax rate of 23% for 2018 (which should be close to Boeing’s future long term tax rate). Now we need to clean up the Invested Capital. First, we start with the premise that it is the Invested Capital reported at the end of the previous year that generates the earnings in the current year. We do not use the invested capital reported at the end of the current year (2018) but instead use the reported 2017 numbers. We need to establish the book value of invested capital used to fund the operating assets. In this instance, we take the total equity in the company’s Financial Statements and add the total debt. In the last section, we established that Operating Leases are really debt. We add the value of the Operating Lease Debt to the reported total equity and total debt. 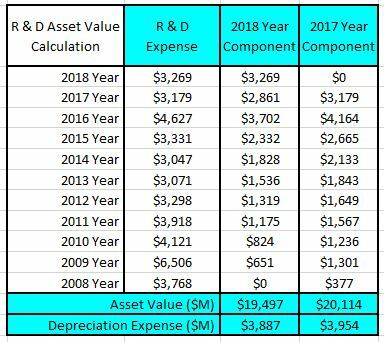 We also need to add in the value of the notional R & D Asset at the end of 2017. We need to subtract the non-operating investments from this total because the benefits from these investments are not included in the Operating Profit. This means that the value of the Cash and Marketable Securities and Equity Investments are all eliminated from the Invested Capital. We also need to look at what acquisitions the company has recently made. Invariably these acquisitions create an item on the Balance Sheet called Goodwill. There is an argument that Goodwill represents the over-payment for productive assets but there is also a counter-argument that elements of Goodwill also represent future growth investments. I think that there are merits on both sides of this argument so I am hedging my bets. If a company has Goodwill on its Balance Sheet I eliminate 50% of it and subtract that value from the company’s total capital. However, I then progressively add-back the discounted Goodwill to the Invested Capital over the remaining forecast period in my model as the growth benefits are consumed. Finally, we need to check what asset write-offs the company has made over recent years. Companies attempt to expunge the record of their past mistakes by writing down the value of their operating assets. Unfortunately, shareholders have funded these investments and they need to be accounted for. I estimate the after-tax total of these write-offs and add it back to the Invested Capital. In the case of Boeing, there has been write-downs in most years. I estimate that over the last 12 years the write-down total is approximately $1,248 M.
You may ask why I have gone to all of this trouble in making these adjustments. The answer is - in Valuation one of the key questions to be answered is - what is the difference between the company’s return on invested capital relative to its cost of capital and if there are excess returns – how long will they last? I estimate that Boeing’s adjusted Return on Invested Capital for 2018 (based on a notional effective tax rate of 23) is 40.7%. We are nearly ready to do some valuation work but there is one important metric left to consider. In order to develop a long term Cost of Capital for Boeing, it is often insightful to understand what the typical capital structures are for comparable companies in the Sector. Once again I have relied on a comparison with Airbus. This metric is used to estimate the amount of leverage that a company is applying to its Balance Sheet. The data clearly demonstrates Boeing’s financial strength. 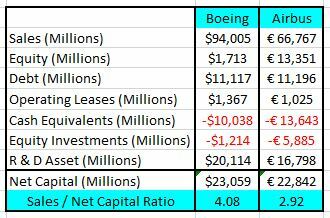 Boeing’s Balance Sheet is very conservatively geared and could sustain an increase in leverage. I suspect that over time Boeing will increase its level of gearing. Defense contracts are typically fixed price and Boeing (like many other key Defense suppliers) has a history of cost over-runs. Care must be taken in the pricing of risk within future contracts. 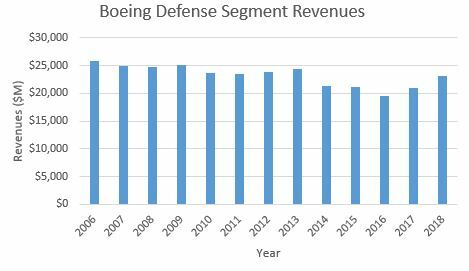 Boeing several years ago completed a major restructuring of its Defense business as the volume of sales went through a cyclical downturn. Although global defense budgets remain tight there are indications that this sector may be moving into an expansionary stage. Care must be taken how this is managed to ensure that the long term returns on investment are optimized. The Commercial Aircraft division has a significant exposure to China. Approximately 20% of current back-orders are for China. The resolution of the current US–China trade dispute may impact future orders. In the future, China could very well become a competitor for the supply of commercial aircraft. There are concerns that Boeing’s supply chain capability may not keep pace with the demand for aircraft. There are also rumors that Boeing has been very aggressive in its pricing negotiations with its suppliers which may be impacting the supply chain’s capability. The resolution of these issues may impact both Boeing’s future growth and gross margins. Boeing has been shrinking its R & D investments. They are now significantly lower than Airbus (on a per unit sales basis). Over time will this lead to a loss in technical capability or will Boeing be forced to significantly increase its spending rate? Time will tell. 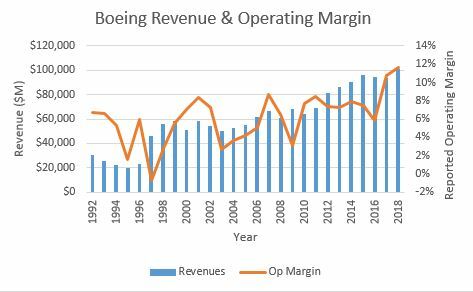 Boeing’s relatively high operating margins and high returns on invested capital clearly demonstrate the strength of its competitive advantages or “moat”. Boeing's wide moat was discussed earlier in the article. I expect that the moat will remain in-tact for many years to come. The company has benefited from excellent management over many years. They have made sound decisions regarding the company’s strategy and capital allocation. It must be noted that the company’s core segments operate in cyclical markets which are heavily dependent upon the health of the global economy. Boeing’s markets are mature and the industry participants have a common view on the future demand levels within the market. the projection of 4 to 5 % commercial airline market growth into the future is not unreasonable. I don’t believe that there will be any major changes in market-shares between Boeing and Airbus as it is not in the interests of the customer base to allow one to become more dominant than the other. I have assumed that there is no significant shift in sales mix or margins over the forecast period. I suspect that at some point in the future China may well sponsor one of their state-owned enterprises to enter the market (particularly the domestic Chinese market). For this reason, I have lowered Boeing’s long term growth rate back to 2.7% (the current risk free rate). I expect that the Defense sector will continue to be relatively flat in terms of long term demand but with some spikes in demand from time to time. I expect that future operating margins will remain at current levels but there will be some peaks in periods of strong market demand and troughs during the inevitable down cycle of the market. I expect that Boeing will continue to supplement their new product development through the use of relatively small corporate acquisitions (notwithstanding the yet to be completed Embraer transaction). The DCF is relatively straight-forward. A Free Cash Flow to the Firm approach is used with a 3 stage model (high growth, declining growth and maturity).The model only seeks to value the cash flows of the operating assets. The valuation has been performed in $USD. Revenues will grow at 5 ± 2% for the next 5 years before growth begins to decline to GDP (2.74%) at the end of year 10. Operating Margins (which have been adjusted for the impact of operating lease expenses and R & D investments) will be flat in a range of 11.4 ± 1% into perpetuity. Capital productivity (as represented by Δ Sales / Net Capital) will decrease from the current level of around 4 as new planes are developed in the future and settle at 1.85 ± 0.5 (which is at about the 75 th percentile for the Sector). The current Return on Invested Operating Capital (around 40% in 2018) will decline over time before settling at 12 ± 1% in perpetuity. This will be above the cost of capital thus reflecting the strength of Boeing’s moat. The current Cost of Equity is estimated to be 9.59% based on a US dollar risk-free rate of 2.76% and an Equity Risk Premium of 5.89% (I have used Damodaran’s December mature market ERP of 5.68% and adjusted for country risk in proportion to the estimated company revenues by region). Based on these inputs, the current Cost of Capital is estimated to be 9.17%. I expect that Boeing will take on additional leverage over time so I have allowed the mature Cost of Capital to decrease to 8.5 ± 0.5%. I have used a Black-Scholes pricing model to value the management options at $1,014 M.
As the Equity Investments are not very material in size I have valued them at their current Book value. I have noted that Boeing’s long term pension obligations are unfunded and at the end of 2018 were stated to be $15,323 M.
I also developed a Monte Carlo simulation for the valuation based on the range of inputs for the valuation. The output of the simulation was developed after 40,000 iterations. 48% comes from the Revenue growth forecast. 12% comes from the Stable phase Cost of Capital. The simulation clearly demonstrates that the value driver in Boeing’s valuation is the Revenue growth forecast and the Adjusted Operating margin. These variables most affect the valuation and are the greatest sources of risk in the valuation. The simulation indicates that at a discount rate of 8.5%, the valuation for Boeing’s equity per share is between $171 and $272 per share with an expected value around $214. I added back the value of the customer debt ($2,695 M) that is owed to Boeing from their customers who have purchased aircraft on credit. I have subtracted the value of the unfunded pensions ($15,323 M) owed by Boeing to its retired employees. Now potentially for some readers of this analysis, this last adjustment may be controversial. After all, it is worth about $26 per share on the valuation. Nevertheless, this obligation is real and if Boeing was sold today as a going concern this adjustment would be made to the value of the company. I have reviewed the relevant assumptions associated with the actuarial calculations in the 2017 Annual Report. These assumptions appear to be quite reasonable therefore I have no basis to doubt the estimate provided by Boeing’s management as stated in their Balance Sheet. If you were only planning to be a short term holder of Boeing you might choose to ignore this discount as the financial impact of the unfunded pension fund will not be felt for many years. What happens to the Valuation if the Growth period is extended to 20 years? Another concern that some people may have with the valuation is that I have assumed Boeing’s revenue growth will only exceed GDP for the next 10 years. There are very few companies that can achieve a growth runway that exceeds GDP for longer than 10 years but essentially Boeing has achieved an average compound annual revenue growth rate of around 5.7% for the last 29 years.Clearly, Boeing is a very special company. I developed another valuation for Boeing using a 20 year revenue growth runway (10 years of constant 5% growth followed by 10 years of gradual decline to a stable growth of 2.74%. I changed nothing else in the valuation inputs. The impact on the calculated valuation was to increase it by less than $10 per share. This is not surprising as the Free Cash Flow generated by the additional growth years is more heavily discounted because of the additional time. So it is fair to conclude that the gap between my valuation and the current market price is not caused by the market assuming a longer growth runway for the stock. This means that for the current market price to be an accurate reflection of the valuation – one of the key valuation input assumptions must be different. What about the impact of the Embraer acquisition? As I stated earlier, Boeing has announced that they expect to close on the Embraer J-V later this year. Now I haven’t included any benefits from this acquisition in my valuation. This perhaps may explain some of the gap between my valuation and the current price. Although I haven’t shown it in this article, I have developed a high level valuation for Embraer. Admittedly, it was based on the historical financial performance of Embraer and I did not include any significant changes as a result of Boeing’s involvement in managing the company. The valuation I got for Embraer is around $2,500 M. According to Boeing’s 8-K filing earlier this year they have valued Embraer’s total equity at $5,250 M.
In my opinion, I think that Boeing has overpaid for Embraer. I don’t think this transaction helps to explain the gap between my valuation and the current market price for Boeing. What Valuation inputs need to change to justify today’s price? As I discussed earlier the key value drivers in Boeing’s valuation are the operating margins and the expected sales growth. The Valuation Sensitivity table indicates that in order to justify a price above $400 per share, Boeing’s growth rate would need to essentially double and the adjusted Operating margin would need to increase to levels that the company has never before experienced. I think that this scenario is implausible. 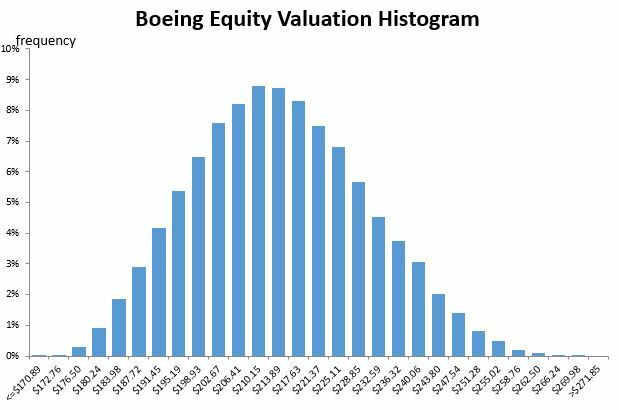 Boeing’s value of equity is estimated to be between $171 and $272 per share with an expected value of $214 (based on a Monte Carlo simulation with 40,000 iterations). As the current market price is significantly higher than the company’s intrinsic value (based on my market assumptions), Boeing is EXPENSIVE. Boeing has had tremendous share price appreciation over the last few years and Boeing’s share price is currently at an all-time high for the company. An important question to ask is where are we in the current economic cycle? I suspect that the global economy is closer to the peak of the current expansion (if it hasn’t already peaked). This would suggest that now is not the time to be buying cyclical stocks unless they are very cheap. We should be buying cyclical stocks in the bottom half of the economic cycle when they are cheap. Boeing is a great company with a strong competitive moat – but it currently doesn’t represent good value. I think that it is time to take some profits from Boeing. I want to be a long term holder of Boeing stock but I will be selling a portion of my holding (probably around 20%) now that the stock has breached $400. Given the positive momentum around the stock I expect that until there is a major market shock, Boeing’s share price may continue to rise (I have no way of knowing). It is for this reason I am not selling more stock immediately but I will continue to harvest profits as the share price continues to rise. I recommend that if you are a holder of the stock then you should consider taking some profits.